Visit us at the fol­low­ing trade fairs and take the op­por­tu­nity to talk to us. 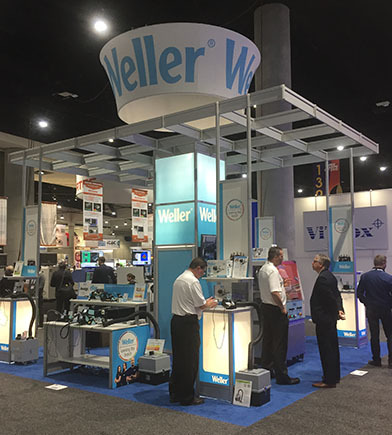 Weller pre­sented a new booth de­sign and in­no­va­tions in San Diego from Jan­u­ary 29 – 31, 2019 at the IPC Apex Expo fair, the largest event for elec­tron­ics man­u­fac­tur­ing in North Amer­ica. A high­light for the booth vis­i­tors was the WTBR 1000 sol­der­ing robot. The Weller robot per­forms sol­der­ing tasks with the high­est of pre­ci­sion. The new range of sol­der­ing tips also aroused great in­ter­est. Weller ex­tended its ac­tive sol­der­ing tip range (RT) and will offer an ex­tended high-end prod­uct range of ac­tive sol­der­ing tips for the WX plat­form in the fu­ture. 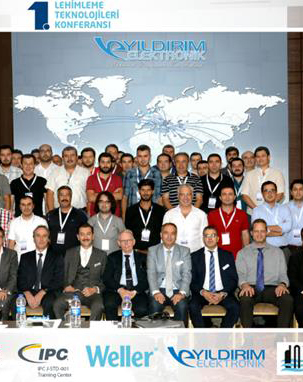 From No­vem­ber 13 – 16, 2018 elec­tron­ica is an in­ter­na­tional gath­er­ing for the elec­tron­ics in­dus­try. This is where ex­hibitors pre­sent prod­ucts and ser­vices that will de­fine our fu­ture. Join us at our part­ners and test our new sol­der­ing sta­tion WT 2M. We look for­ward to see­ing you! After three in­ten­sive days of events in Nurem­berg, we look back on a suc­cess­ful SMT Hy­brid & Pack­ag­ing trade fair. SMT cov­ered the com­plete spec­trum for sys­tem in­te­gra­tion in mi­cro­elec­tron­ics. Trade vis­i­tors from all over the world were able to gain an ex­cel­lent overview of the en­tire value chain and net­work specif­i­cally in the in­dus­try. De­spite vis­i­bly fewer vis­i­tors, the Weller prod­ucts met with great in­ter­est. Es­pe­cially the au­to­mated sol­der­ing so­lu­tion WTBR 1000 im­pressed with high­est sol­der­ing pre­ci­sion and re­li­a­bil­ity. IPC Apex Expo 2018, the in­ter­na­tional elec­tron­ics in­dus­try ex­hi­bi­tion in North Amer­ica, opened its gates to vis­i­tors in March. The pos­i­tive re­sponse to the pre­sented prod­ucts and tech­ni­cal dis­cus­sions in­di­cated that the ex­hi­bi­tion stand was an over­all suc­cess. The in­ter­ested vis­i­tors in San Diego had the op­por­tu­nity to ex­pe­ri­ence Weller ap­pli­ca­tion so­lu­tions live, to test the var­i­ous prod­ucts for sol­der­ing, and to pick up tips and tricks first hand. 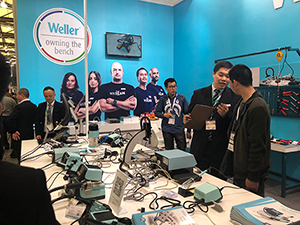 The Weller team en­joyed an­other suc­cess­ful pro­duc­tron­ica trade show in Shang­hai, the in­ter­na­tional trade fair for elec­tron­ics de­vel­op­ment and pro­duc­tion. 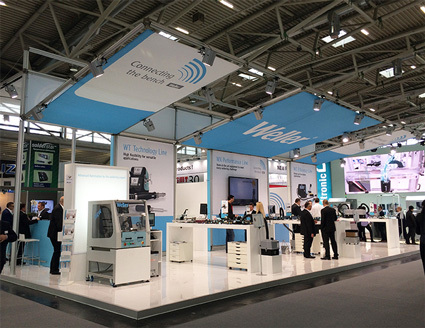 In par­tic­u­lar the prod­uct demon­stra­tions for the bench­top robot WTBR 1000 and the new pow­er­ful WE 1010 sol­der­ing sta­tion pro­duced huge in­ter­est and re­ac­tion within the booth with our vis­i­tors. Full booth, con­struc­tive dis­cus­sions and pos­i­tive feed­back show us that the pro­duc­tron­ica is an im­por­tant plat­form for Weller. “We pre­sented our prod­uct high­lights to a global au­di­ence and we had a lot of in­ter­est­ing and high qual­ity con­ver­sa­tions and dis­cus­sions," shares Thomas Schulz, Vice Pres­i­dent, Sales, EMEA. "The great in­ter­est in con­nec­tiv­ity so­lu­tions shows that dig­i­tal­iza­tion has taken an im­por­tant role in the elec­tron­ics man­u­fac­tur­ing in­dus­try. Weller is al­ready con­nect­ing the bench, and were ready for the fu­ture." 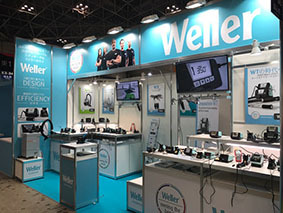 Weller con­nect­ing the bench Focal point of the Weller booth was con­nec­tiv­ity so­lu­tions for sol­der­ing, the trend­ing sub­ject in the elec­tron­ics man­u­fac­tur­ing sec­tor. What has been con­trolled man­u­ally and via cable is be­com­ing dig­i­tized. Weller has long been able to ex­change data from fume ex­trac­tion sys­tems with sol­der­ing sta­tions or trace­abil­ity sys­tems. At pro­duc­tron­ica vis­i­tors were con­vinced of the next level to­wards the fu­ture: In­tro­duc­ing the Weller Smart Work­bench – Cloud-based data ex­change be­tween work bench and cen­tral input de­vices. New au­to­mated sol­der­ing sys­tem WTBR 1000 Huge in­ter­est was also shown in the new au­to­mated bench top sol­der­ing so­lu­tion, the WTBR 1000: a one-of-a-kind syn­ergy of pre­ci­sion, con­sis­tency and pro­tec­tion of sol­der­ing tasks. Weller Ef­fi­ciency Line With the new Ef­fi­ciency plat­form Weller pre­sented fur­ther op­ti­mal so­lu­tions for cost-con­scious sol­der­ing ap­pli­ca­tions. Sim­ple and ef­fi­cient – while con­cen­trat­ing on the es­sen­tial. Weller Spon­sor des IPC Hand Sol­der­ing Com­pe­ti­tion It was also ex­ited at the IPC Hand Sol­der­ing Com­pe­ti­tion. Weller was gold spon­sor of this event and awarded the win­ner with a Weller sol­der­ing sta­tion. A spe­cial high­light at the booth was the pre­sen­ta­tion of the WT-se­ries prod­ucts and so­lu­tions (WT, WT 1H, WTHA) as well as the high-class WX-se­ries from which the mar­ket ex­pects no less than a new global stan­dard for "Trace­abil­ity POKA YOKE". A va­ri­ety of prod­uct pre­sen­ta­tions were re­quested by new and po­ten­tial cus­tomers and an high num­ber of leads were gen­er­ated. With more than 110.00 vis­i­tors, NEP­CON is one of the most im­por­tant trade fairs for elec­tronic man­u­fac­tur­ing and R & D in Japan, South Korea, China and the SEA coun­tries.